In November, Facebook released a new feature allowing for an increase in height for Link Click ads. Designed to improve consistency and user experience across ad platforms (Facebook and Instagram), this rollout essentially allows for the use of 1:1 creative across Facebook News Feed and Instagram Feed without any image cropping. You may be thinking, so what? This wasn’t really a huge issue for me in the past anyways. But wait! Don’t mistake this seemingly small upgrade as insignificant. We’ve found it to be quite the game changer – here’s why. Facebook’s new 1:1 creative format gives brands increased screen real estate and a larger share of voice, thus giving users a more native experience. This impact is seen most frequently on news feeds, especially on mobile devices where the amount of screen real estate is increasingly important. 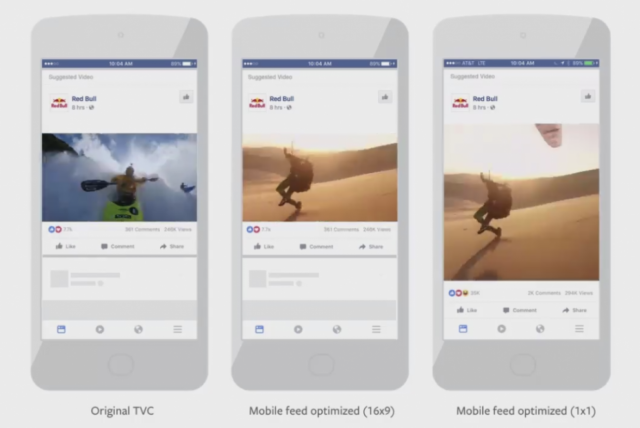 The two images on the left in the above examples show how Facebook previously presented ads in the mobile news feed, while the image on the right shows how presents the ad in the 1×1 creative format. The 1×1 ad occupies twice the amount of ad space. It basically takes up the whole screen! Don’t believe the screenshots? Take a look at the data. In a two week period, we A/B tested the same image – one 1:1 and one 1.91:1 – and the numbers speak for themselves. In engagement metrics alone, square images drove 85% higher CTRs, 30% lower CPCs. When we look at the difference in purchase volume, revenue, and ROAS, it’s a no-brainer. The percent difference is in the thousands. 1:1 for the win. If you’re stuck in a landscape image rut and looking for a way to increase your mobile presence, give this new aspect ratio a test. On Facebook, it’s hip to be square. Contact us if you’re interested in learning more. First-year Metric Theory clients grow 68% on average. © 2019 Metric Theory. All Rights Reserved.